The 1980s rehabilitation of the walrus heads case study demonstrates the potential for well-intentioned rehabilitations and repairs of problems in historic buildings to create further problems and cause further damage to the building. 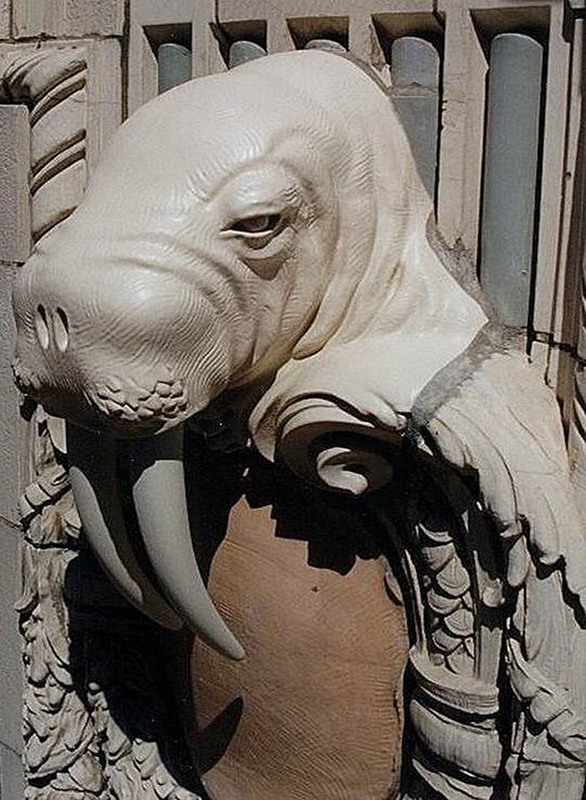 The contribution of the successful 1990s rehabilitation of the walrus heads to preservation and future-proofing of the Arctic Building led to the successful conversion to a boutique hotel. While this particular case study addresses decorative terra cotta elements, the consequences and the application of the principles of future-proofing are relevant in all types of interventions in historic buildings wherever a cultural heritage policy document such as the Secretary of the Interior’s Standards (Weeks 2000) is applied, as will be discussed later. 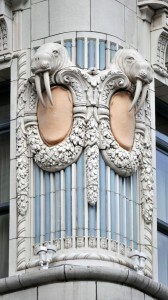 Figure 1: The double walrus heads at the southwest corner of the Arctic Building in Seattle, Washington. Note the highly decorative terra cotta, bright colorful palette, and the tusks that hang from the walrus heads. Credit: Brian Rich, 2013. After the Alaska Club merged with the Arctic Club in 1908, the Arctic Club launched efforts to “construct a Class A fireproof building especially designed for the club” (Davis 1981, 10 2003). In 1917, A. Warren Gould, architect for the owner, pioneered the use of lightweight glazed molded terra cotta over a reinforced concrete frame to create the ornament on the exterior of the building and to resist fires like the Seattle fire of 1889. The Arctic Building was recognized as one of the finest examples of multicolored matte-glazed terra cotta in the Northwest (Figures 1, 2, and 3). It had “been well received by the public, and [had] won much commendation, which after all is the true measure of success,” according to Gould in a Pacific Builder and Engineer article of February 23, 1917 (Davis 1981, 13; DeCoster 2010). 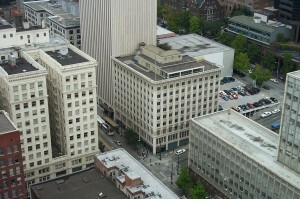 Figure 2: Aerial photo of the Arctic Building from the southwest. Credit: City of Seattle Archives, SPU Fleets and Facilities Department. Imagebank Collection. Item No: 120399. The Arctic Club Building remained the home of the club until 1971. 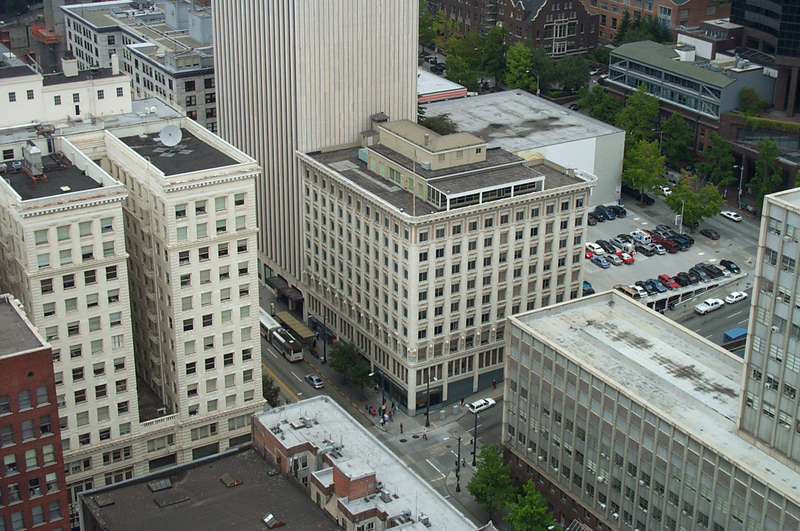 From 1971 until 1988, the privately managed building was leased to the city of Seattle. In 1988, it was sold to the city of Seattle and used for city offices and public events (DeCoster 2010). Throughout this period of time, there were several interventions in the building as it was transformed fully to city office use. In 2005, a new private owner rehabilitated the building, converting it into a boutique hotel. The Arctic Club Building was listed on the Washington and National Registers of Historic Places in November 1978. 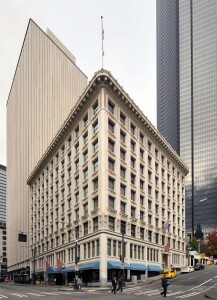 The building was also designated a City of Seattle Landmark on April 4, 1985. Figure 3: View of the exterior of the Arctic Building from the intersection of Third Avenue and Cherry Street. The walrus heads adorn the third floor. Credit: Brian Rich, 2013. 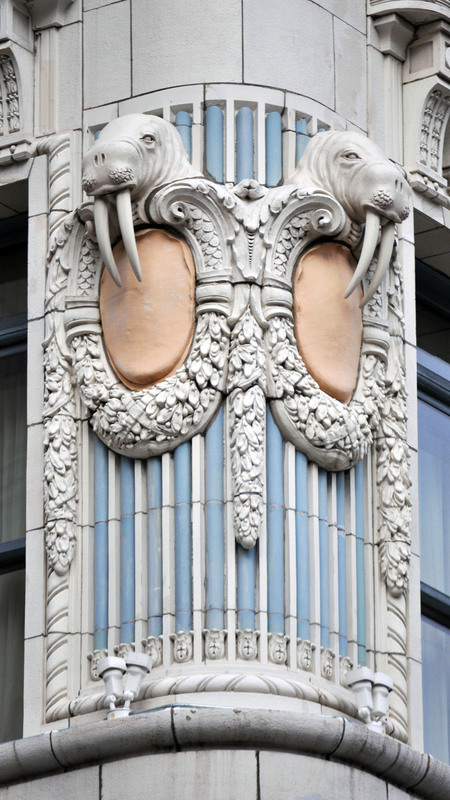 Several exterior interventions were made to the Arctic Building during the 1980s and 1990s, though this case study focuses on the twenty-seven walrus heads. Though the walrus tusks are said to have been removed after the 1949 earthquake, some tusks must have remained in place until 1982 (Woodbridge, Montgomery, and Streatfield 1980, 123). In 1982, all of the walrus tusks were replaced by cast urethane plastic replicas. 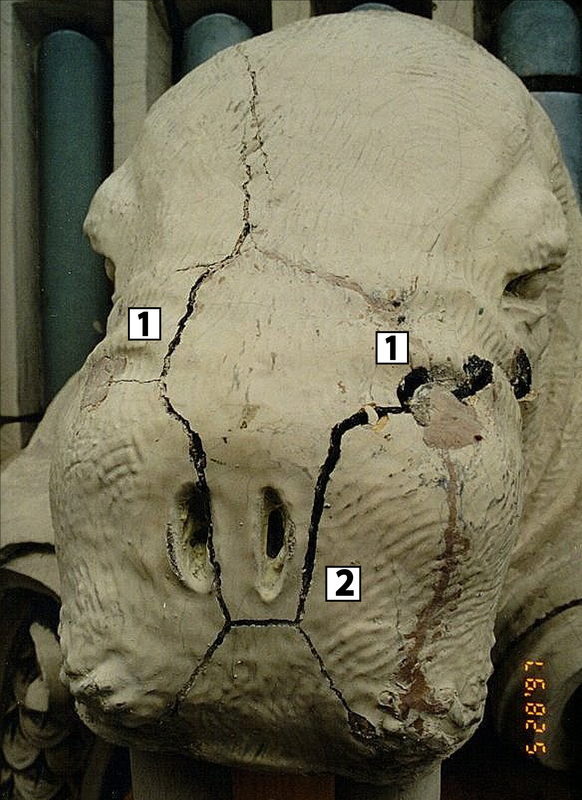 It was reported in 1996 that the original tusk failure had occurred due to “corrosion of the mild steel used to anchor the tusks into the terra cotta heads,” but there are no records to corroborate this information (Morden and Slaton 1996, 2). 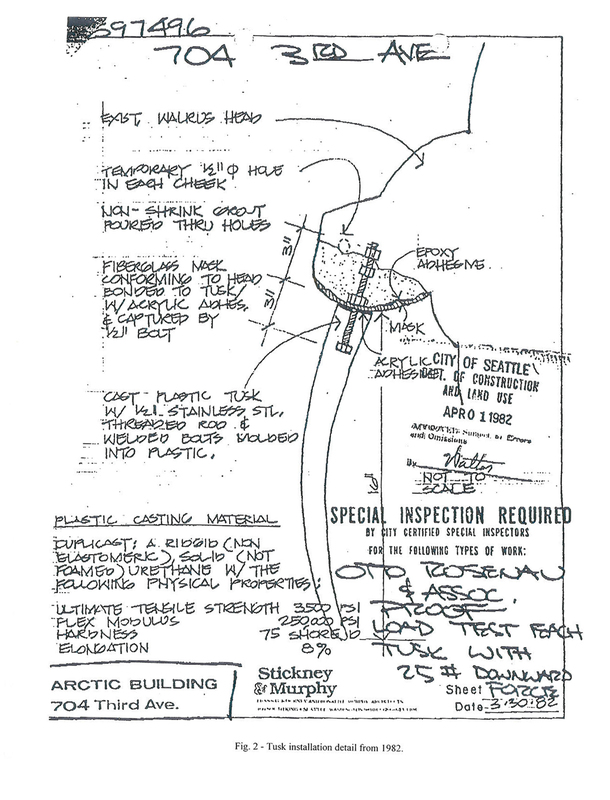 Details developed for the 1982 tusk restoration called for four major items to be installed (Figure 4). These items included new cast urethane plastic tusks, stainless steel threaded rods, a fiberglass mask to reconstruct the walrus face, and non-shrink grout. To anchor the new tusks, the cavities of the terra cotta walrus heads were filled with a combination of gypsum and Portland cement grout. The details called for holes on the front of the walrus snout to inject the grout. According to the 1982 design detail, the grout not only anchored the tusk, but held a fiberglass mask in place as well. The original mild steel rods supporting the original terra cotta tusks were removed in the 1982 restoration (Morden and Slaton 1996, 6). Within one to two years after the 1982 tusk replacement, minor repairs of new cracks observed in the walrus heads were performed. Figure 4: Section detail of 1982 walrus tusk replacement detail by Stickney Murphy Architects. Credit: Image courtesy of the Seattle Landmarks Preservation Board. Original detail by Stickney & Murphy Architects, 3/30/1982. In late 1995, a condition survey and investigation of the walrus heads was performed by Wiss Janney Elstner (Morden and Slaton 1996). Overall, the building was determined to be in “good condition,” but the walrus heads were a different story. The degradation of the walrus heads had progressed to the point where the ornamental terra cotta units were wrapped with chicken wire and duct tape to hold the pieces together until repairs could be made (Morden and Slaton 1996, 1). A field survey of the walrus heads found many modes of deterioration present. Fractures, spalling, cracks, crazing, and rust jacking (expansive corrosion of ferrous metals) were observed. The investigation discovered that the holes for the 1982 grout injection were located at the top surfaces of the walrus heads rather than on the vertical surfaces as detailed in the repair plan (Figures 5, 6, and 7). The 1995 investigations also discovered that the fiberglass masks had not been installed (Morden 2013). Figure 5: Existing conditions in late 1995. Note the dark spots above the nostrils to the right and left (1). These are the holes grout was filled through. Note that they are on top of the walrus head. Also note the cracking of the snout (2). Credit: Wiss, Janney, Elstner Associates, Inc. 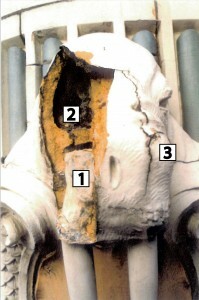 Figure 6: 1996 inspection photo of walrus head S-1. Note the white grout sections filling the sinus cavity area of the walrus head (1). This meant there was no space left for the grout to expand into when the gypsum got wet. Note also the crack in the internal webbing (2). The damage to the internal structure of the head was so severe that this head had to be replaced. Note the cracks radiating from the dot on the top right of the walrus snout (3). This dot is the injection point for the 1982 grout installation and created a weak point in the terra cotta. Credit: Morden & Slaton, WJE. On-site observations of the locations of the cracks in the walrus heads provided important clues about the deterioration. The cracks were located around the grout injection holes and the voids in the terra cotta where the grout had been injected (Morden 2013; Morden and Slaton 1996, 6). There are several potential deterioration mechanisms in glazed terra cotta cladding systems. These include crazing of the glazed face of the terra cotta; spalling; deterioration of the anchors or mortar; and unrelieved stresses due to settlement, movement, or rust jacking (Tiller 2004, 67-69). Many of these were observed in the 1996 investigation and repaired in the subsequent rehabilitation work. Although several of these factors contributed to the deterioration of the walrus heads and tusks, the key causes of the deterioration were (1) the original mild steel anchor rods for the tusks, (2) the grout injection hole location for the 1982 rehabilitation, and (3) the gypsum-Portland cement grout that was used in the 1982 tusk replacement. In the 1982 tusk replacement, stainless steel anchors were used for the new tusk anchors to avoid rust jacking. The force of rust jacking can split stone and other masonry materials over time (Tiller 2004, 68). Because stainless steel anchors were used, rust jacking was precluded as the cause of the cracking of the walrus heads. The location of the grout injection holes is a likely contributor to the deterioration of the walrus heads. Water likely penetrated the terra cotta units and the grout infill within the walrus heads through the grout injection holes in addition to existing mortar joints, cracks, and spalls in the glazing (Morden and Slaton 1996, 6). The location of the grout injection holes may have made this water infiltration worse because they were located on top of the walrus heads. In addition, however, the hole location also allowed the grout to fill the entire terra cotta cavity, leaving the grout no place to expand. Gypsum and Portland cement are usually used together to combine the benefits of the rapid hardening of gypsum with the long-term strength and durability of Portland cement. Typically, gypsum quantities in such grout mixes are strictly limited by ASTM C150 to balance gypsum expansion and shrinkage of the grout during curing (Hime 1993). Conditions where there is excessive gypsum can lead to sulfate attack. Sulfate attack is the chemical reaction of gypsum to water, resulting in ettringite. Delayed ettringite formation (months or years after initial curing) causes heterogenous expansion (equal in all directions) and pressure on the surrounding terra cotta, resulting in cracking or spalling of the terra cotta (Collepardi 2001, 1-2). Eventually the chemical reaction between the gypsum and water would convert all of the gypsum to sulfate compounds and stop, but it is impossible to tell when that process would be complete (Morden 2013; Morden and Slaton 1996, 6). Material samples of the grout that held the walrus tusks were taken and confirmed a high percentage of gypsum in the grout. A material analysis found that the grout consisted of 32 percent deleterious sulfate compounds. These compounds were in the form of gypsum (calcium sulfate hydrate) and ettringite (calcium sulfoaluminate hydrate) (Backus 1996). In this instance, because of the full cavities, there was no place to relieve the pressure from the ettringite formation. The initial 1996 restoration plans included replicating ten walrus heads in terra cotta to match the originals where structural integrity was completely compromised and replacement pieces were recommended. A total of twelve walrus heads were replaced after two were later found to be too severely damaged to be repaired. Alternative materials for replication were considered, but since the cost was approximately the same, terra cotta was preferred in accordance with the Secretary of the Interior’s Standards for Rehabilitation (Morden 2013). All of the urethane tusks had been salvaged and were reinstalled in the new heads by bolting them through the new terra cotta. No grout was used to install the tusks (Morden 2013). A variety of repairs were planned for the remaining fifteen of the twenty-seven walrus heads. Where structural integrity was believed to be acceptable, the walrus heads were repaired. Additional helical anchors were provided for seven walrus heads where sections of terra cotta were beginning to delaminate. Where possible, cracks were cut out to a width and depth suitable for grout infill (Figure 8). The 1982 gypsum-Portland cement grout was removed to the extent possible (Morden 2013). Repairs of the other modes of deterioration were also performed. 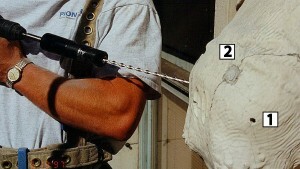 Figure 7: 1996 walrus head rehabilitation. Note the drilled hole (1) for insertion of a helical anchor to pin sections of the walrus snout that had fractured due to expansive grout in the cavities of the terra cotta unit. The white dot (2) on top of the nostril is where the expansive grout was injected in the 1982 repair. Credit: Wiss, Janney, Elstner Associates, Inc. Figure 8: 1996 replica walrus head. The joints between terra cotta pieces are filled with mortar after the epoxy sets around the threaded rod anchors. Credit: Wiss, Janney, Elstner Associates, Inc. The condition of the walrus heads has been monitored in multiple ways since the 1996 rehabilitation in order to ascertain whether there has been any further deterioration of the remaining walrus heads. Follow-up review of the walrus heads has been performed by Wiss, Janney, Elstner as well as by the building maintenance personnel through the late 1990s and no additional issues were observed (Morden 2013). The 2005 Certificate of Approval application for rehabilitation of the Arctic Building as a boutique hotel does not note that any work on the terra cotta facade would be required other than cleaning (Day 2005). The terra cotta facade elements are noted as being “intact and in fair to good condition” (Day 2005 <<Pages of cite?>>). However, it is reported that minor repairs have been undertaken to the terra cotta focusing primarily on stabilization of the parapets. No further rehabilitation of the walrus heads was required at the time of the rehabilitation according to the architects (Weaver 2013). Photos of the current conditions taken in November 2013 by me were reviewed and discussed with Mark Morden during a 2013 interview regarding the project due to concerns about further deterioration. Based on the limited information in the photographs, Morden concluded that there had been no further deterioration (Morden 2013). The case study of the interventions on the walrus heads at the Arctic Building is an example of two repairs, one of which in 1982 caused further damage to the historic building, and a second one in 1996 that resolved all of the issues in the original walrus head design as well as the 1982 restoration. It is difficult if not impossible to be certain that any design, original or an intervention in an existing building, will be a long-term solution. The two rehabilitations of the walrus heads, while chronologically close to each other and addressing the same portion of the Arctic Building, raise questions about how we can know that our designs are going to endure. What can we learn from these two interventions? How can we improve our rehabilitation process and prevent ourselves from unwittingly incorporating flaws in our designs? How can we make our designs more reliably successful? These interventions serve as an example of how the concepts of future-proofing and resiliency could have supported the rehabilitation process. Consideration of the concepts of future-proofing and resiliency in both the AEC and other industries led to the development of a set of principles of future-proofing that may be used as a tool or rubric in support of the rehabilitation process when working with historic buildings. In the instance of the walrus head rehabilitations, we can retrospectively apply the principles of future-proofing to demonstrate how they would have affected the 1982 rehabilitation and how the 1996 rehabilitation is future-proof. How do the principles of future-proofing help to solve the problem of the interventions in the Arctic Building? Was the Arctic Building a future-proof building even before the interventions? 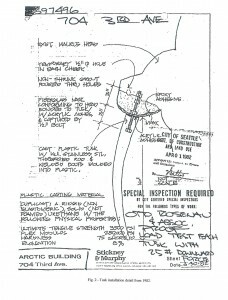 Consideration of the principles of future-proofing help to prevent the problems of the Arctic Building by preventing the inclusion of flaws in the design in the first place. This may be demonstrated through the application of the principles to each of the designs. There is an argument to be made that the Arctic Building, as a whole, is a future-proof building. The existing glazed terra cotta shell of the building can last for centuries if it is well maintained. Terra cotta is a durable material that endures the moderate Pacific Northwest weather well. The flaws in early twentieth-century terra cotta building systems are well known today and can be overcome with thoughtful consideration (principle 1). The building is also easily understood as an historic building in its exterior appearance and significant interior spaces that have been renovated and converted to new uses over time. These uses included the original Arctic Club headquarters, with leasable spaces for their tenants, adaptive reuse as offices and public event spaces for the city of Seattle, and adaptive reuse as a boutique hotel. Attitudes toward this building have been clearly flexible in finding ways to accommodate different uses and tenants (principles 2 and 3). The Arctic Building continues to demonstrate its future-proof nature through adaptation to the new uses without losing its historic character, even including additional floors being added to the building (principle 3). With careful rehabilitations, the building’s service life has been extended into the foreseeable future (principle 4). The building has been fortified against the most significant danger in Seattle, earthquakes, through a complete seismic retrofit. The most recent rehabilitation takes advantage of sustainable features such as the high level of daylight exposure of the rooms and the operable windows. This will support the building through environmental changes (principles 5 and 6). With the complete rehabilitation in 2005, all of the building systems have reduced the potential for physical, functional, and aesthetic obsolescence. The exterior shell of the building has been rehabilitated, including the walrus heads, and the interior has also been rehabilitated for ongoing use, preventing physical obsolescence. The multiple uses of the building over its history demonstrate that the building is unlikely to be functionally obsolete. While aesthetics are in the eye of the beholder, it is clear that the Arctic Building holds broad appeal since that is one of the bases of its designation as a landmark (principle 7). The lifecycle benefits of retaining a masonry and steel structure are clear. Significant resources were used to create the building. 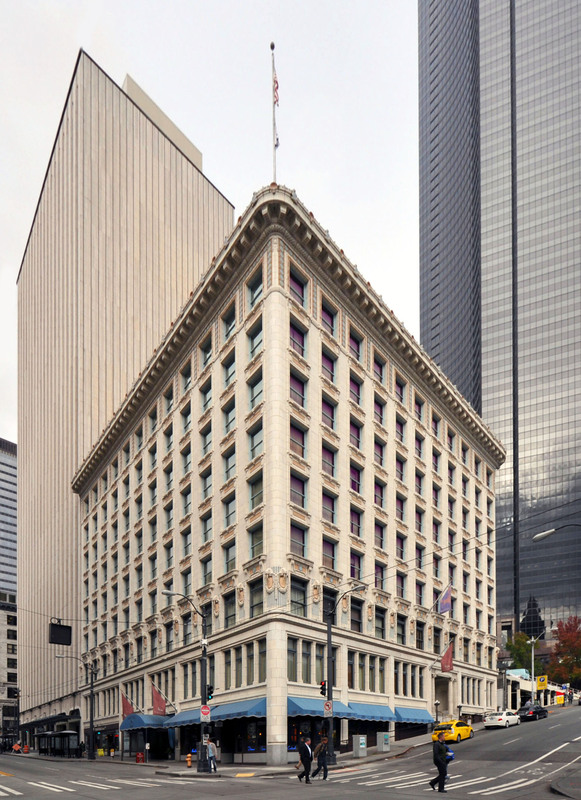 The Arctic Building’s rehabilitation has contributed to the local economy through jobs completing the rehabilitation and by revitalizing a portion of downtown Seattle and bringing more jobs and tourism (principle 8). While the Arctic Building’s materials are most likely not locally manufactured, and the building may not be considered future-proof in this way, many rehabilitation materials are local and certainly the labor to perform the rehabilitations was local (principle 9). Last, it is clear that the cultural heritage policy documents relevant to this building have been followed as a consequence of its designation as a landmark and the stewardship of its owners and architects (principle 10). Another valid question is whether the rehabilitation of the walrus heads was future-proof. Arguably, the 1982 rehabilitation was not, but the 1996 rehabilitation is future-proof. At the time of the design of the Arctic Building, it would have been well known through observation that ferrous metals expand as they corrode. How then would the application of the principles of future-proofing have prevented this problem? Starting with principle 1, if one is aware that ferrous metals deteriorate in an expansive manner and that terra cotta is brittle, one might not believe it appropriate to combine the two materials. Designers combining steel and terra cotta likely would have considered their designs to meet principle 5 as well, believing that the terra cotta cladding protected the ferrous metals from corrosion, especially where glazed terra cotta is used. This exposes one of the challenges of future-proofing and design in general: that we design to the best of our ability. It also underscores the importance of flexibility and adaptability, durability and redundancy. The simultaneous consideration of the principles 1 and 8 may arrive at the conclusion that ferrous metals and terra cotta should not be combined. By considering both the concepts of preventing deterioration and long-term life cycles for buildings at the same time, one may choose to take a different design path. Similar principle-based considerations may be made for the use of the gypsum grout in the 1982 repairs, though the time scale is much smaller since the properties of gypsum were being published in the late 1970s and the repairs were completed in the early 1980s. Certainly a better understanding of the chemical reaction of gypsum and water and the use of high quantities of gypsum in the grout mixture would have made the 1982 rehabilitation more future-proof. If one were to bear in mind the principles of preventing deterioration, extending the service life, and increasing durability, the problem of the expansive nature of the ettringite formation could have been avoided. Closely related to the grout mixture is the amount of grout injected into the walrus heads. Thoughtful consideration of the same principles would have led a contractor to understand that completely filling the terra cotta cavities and giving the gypsum-Portland cement grout no place to expand into was not advisable. Similarly, an understanding of the nature of ettringite formation by the contractor would have led the contractor to place the holes in a less exposed location. The holes may have also been filled with a different material to prevent water infiltration. Regardless of the nature of the 1982 rehabilitation of the walrus heads, what is clear is that the future-proof rehabilitation in 1996 led to preservation of the Arctic Building and its continued viability. In 2005, a new owner rehabilitated the building, converting it into a boutique hotel, giving it a new lease on life and an ongoing role in the heart of Seattle.